Garden Bird Feeder Stand works great in a garden or as a mobile bird feeder platform in a yard. The Garden Bird Feeder Stand is 40 inch high and has a 14" wide hanger arm for a small bird feeder or hanging flag. Great for bird feeders, 12" x 18" flags, wind chimes and much more! 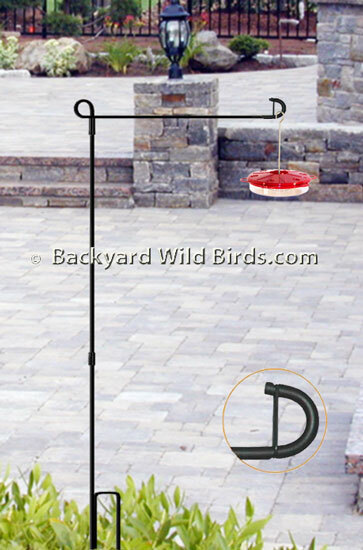 The Garden Bird Feeder Stand has an "h" style stake base, and a long hanger arm. It can be used in places where you can put a stake in the ground like garden bed, off patio, or yard. Place where it would give a perfect view of your songbirds. Would make a perfect platform as a Hummingbird feeder or Goldfinch feeder. The pole has a 14" straight hanger arm with a rubber stop on the end to secure bird feeders, and wind chimes. This is approximately a 40 inches tall pole with a step stake mounting base. The pole has three main sections. The pole has an all steel construction with powder coated black finish. Get yours today and bring nature in for a great experience for all!